With a stay at Walt Disney World Dolphin in Lake Buena Vista (Bay Lake), you'll be a 4-minute drive from Disney's Boardwalk and 5 minutes from Disney's Blizzard Beach Water Park. This 4-star resort is 3.1 mi (5 km) from Epcot® and 3.5 mi (5.6 km) from Disney Springs®. Make yourself at home in one of the air-conditioned rooms featuring refrigerators and flat-screen televisions. Your pillowtop bed comes with premium bedding. Wireless Internet access (surcharge) is available to keep you connected. Private bathrooms with shower/tub combinations feature complimentary toiletries and hair dryers. Relax at the full-service spa, where you can enjoy massages, body treatments, and facials. After dipping into one of the 5 outdoor swimming pools, you can spend some time at the private beach. This resort also features wireless Internet access (surcharge), concierge services, and babysitting/childcare (surcharge). Spending a day of fun is easy with the complimentary theme park shuttle. Grab a bite at Picabu, one of the resort's 12 restaurants, or stay in and take advantage of the 24-hour room service. Snacks are also available at the 2 coffee shops/cafés. Relax with a refreshing drink from the poolside bar or one of the 5 bars/lounges. Buffet breakfasts are available daily from 6:00 AM to noon for a fee. Featured amenities include a business center, limo/town car service, and express check-in. Planning an event in Lake Buena Vista? This resort has facilities measuring 320,000 square feet (30 square meters), including conference space. Self parking (subject to charges) is available onsite. Adjacent to Disney's BoardWalk Resort, Walt Disney World Dolphin is accessible to Epcot and Disney's Hollywood Studios via walkway and complimentary ferryboat. Dining options include Shula's Steakhouse, a stylish seafood restaurant, a Mediterranean-style market, a casual café, and a poolside bar and grill. Recreation facilities include a 3-acre water complex with 5 outdoor pools, an Asian-inspired health spa (surcharge), video arcade (surcharge), 24-hour health club (surcharge), playground, basketball and volleyball courts. Supervised child care is offered nightly at Camp Dolphin (fees apply). Complimentary amenities include scheduled shuttle service to Walt Disney World Resort and Disney's Extra Magic Hours. The resort also includes exclusive Walt Disney World Resort benefits such as Extra Magic Hours at select theme parks and FastPass+ access to reserve select experiences 60 days in advance. Onsite shops sell resort wear, chocolates, and Disney merchandise. WiFi access (surcharge) is available in the lobby and meeting spaces. 98 meeting and conference rooms provide 320,000 square feet of meeting space. Shula's Steakhouse - Sports memorabilia from the Miami Dolphins' 1972 season decorate the walls of this popular steakhouse. Menu favorites include Certified Angus Beef, signature 48-ounce Porterhouse, and seafood. Dinner and drinks served nightly; lounge open from late afternoon until late evening. Todd English's bluezoo - This stylish restaurant specializes in fresh seafood such as sashimi-grade tuna steak, swordfish, and surf and turf. Dinner, appetizers, and drinks served nightly; lounge open from late afternoon until late night. Fresh Mediterranean Market - Meats and poultry are cooked on a rotisserie in the open kitchen. A pastry station provides freshly baked croissants, French baguettes, Danish, and desserts. Open for breakfast, lunch, and drinks. Lighter fare and a children's menu are also available. The Fountain - Offering homemade and soft-serve ice cream, burgers, salads, and sandwiches. Open from late morning until late evening. A children's menu is available. Picabu - A delight for adults and children alike, this 24-hour restaurant serves a wide array of food in a cafeteria-like setting. It also includes a convenience store with sundries, toiletries, snacks, and gifts. Cabana Bar and Grill - A poolside bar serving sandwiches, salads, hot dogs, burgers, and cocktails. Open from late morning until early evening. Lobby Lounge - Pastries and Starbucks coffee are served in the morning; cocktails, beer, and wine are available in the evening. A buffet breakfast includes hot meal items. Room service includes reheating meals (surcharge). Walt Disney World Dolphin has an expansive water complex with a grotto pool with waterfall and waterslide, a children's pool, 2 outdoor lap pools, 3 spa tubs, and a private, white-sand beach. Floats, towels, and beach accessories are available for rental in the Cabana Beach Hut. Camp Dolphin provides supervised nighttime children's activities (surcharge) such as arts and crafts and bead making. The 24 hour health club (surcharge) offers stationary bikes, treadmills, stair machines, strength-training equipment and steam rooms. Other recreation options include a video arcade (surcharge), sand volleyball courts, a basketball court, Segway and paddle boat rentals, and a running track. Guests will also find water skiing, parasailing, and other water sports/activities nearby. Guests enjoy preferred tee times at the 5 golf courses in the Walt Disney World Resort, including the 18-hole Lake Buena Vista Golf Course, 4 miles from the hotel. Bike and watercraft rentals are available at Disney's BoardWalk Resort, adjacent to the hotel. Disney's Fantasia Gardens Miniature Golf Course is across the street. With meditation, tea gardens, and garden and city views, the Mandara Spa specializes in Asian-inspired treatments. Relax in the sauna, spa tub, and steam room, and enjoy aromatherapy treatments, various types of massage, body scrubs, and wraps, facial treatments, manicures and pedicures and reflexology. Guests can use their booking reservation number and Walt Disney World® Resort tickets for complimentary access to Disney’s FastPass+® service, allowing guests to book entry times to Theme Park attractions and events up to 60 days in advance of arrival. 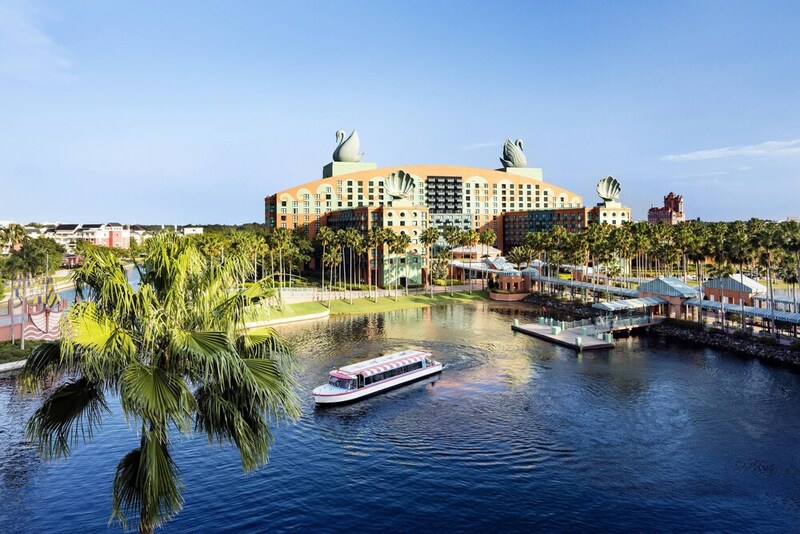 Purchase of a valid Walt Disney World® Resort admission ticket from an authorized Walt Disney World Ticket Seller, a booking reservation number for this property, and online registration required to qualify. Guests must contact the property directly for instructions on how to register and link their reservation; contact information is provided on the booking confirmation email. Offer valid anytime, subject to availability. Restrictions apply. Book a stay in any room or rate category and receive complimentary parking at any Walt Disney World® Resort theme park by showing the resort hotel room key at parking booth.